2 GPM at 1500 PSI. 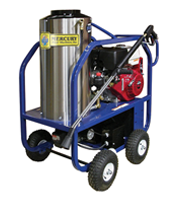 2 HP HD electric motor, 115 Volt, 1 PH, 20 Amps, diesel fired burner. Direct drive with manual hand brake. Includes 42"dual lance wand, trigger gun and 50-foot high pressure hose. Low pressure detergent injector and rebuildable triplex ceramic plunger pump. Four (4) 10-inch pneumatic wheels. 4 GPM at 2300 PSI. 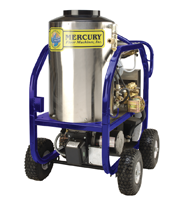 6 HP HD Electric Motor, 220 Volt, 1 PH, 25 Amps, diesel fired burner. Direct drive with manual hand brake. 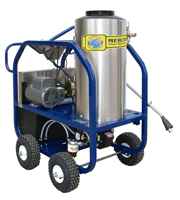 Includes 42"dual lance wand, trigger gun and 50-foot high pressure hose. Low pressure detergent injector and rebuildable triplex ceramic plunger pump. Four (4) 10-inch pneumatic wheels. 4 GPM at 3000 PSI. 11 HP Honda gas engine, 220 Volt, 1 PH, 25 Amps, diesel fired burner. Direct drive with manual hand brake. Includes 42"dual lance wand, trigger gun and 50-foot high pressure hose. Low pressure detergent injector and rebuildable triplex ceramic plunger pump. Four (4) 10-inch pneumatic wheels. 3.5 GPM at 4000 PSI. 13 HP Honda gas engine, diesel fired burner. Direct drive with manual hand brake. Includes 42"dual lance wand, trigger gun and 50-foot high pressure hose. Low pressure detergent injector and rebuildable triplex ceramic plunger pump. Four (4) 10-inch pneumatic wheels.